REAL ID is a federal security standard for identification documents that was created as a result of increased security measures after the September 11, 2001 terrorist attacks. As of October 1, 2020, you will need a passport or identification that is REAL ID compliant when you fly in the U.S. or enter certain federal buildings. Your current ID can be used as official identification when flying within the US until October 1, 2020. After this date, you will need to present a REAL ID or a valid passport to clear airport security, even for domestic travel. If you always travel with your passport, you do not need to update your ID to a REAL ID. A REAL ID or a valid passport will be required to enter certain federal buildings. An invoice, deed, or mail proving Massachusetts residency (utility bill, excise tax bill, first class mail dated within 60 days). All records must be originals. We suggest you start the application process online and bring the printed application with you to the RMV. If your current name does not match the one that appears on your lawful presence document(s), you must prove the legal name change with an acceptable document in order to qualify for a REAL ID. A marriage certificate, divorce decree, or court document all qualify. If you do not want to obtain a REAL ID, but are renewing or applying for a license, you will still need to present documentation proving lawful presence. 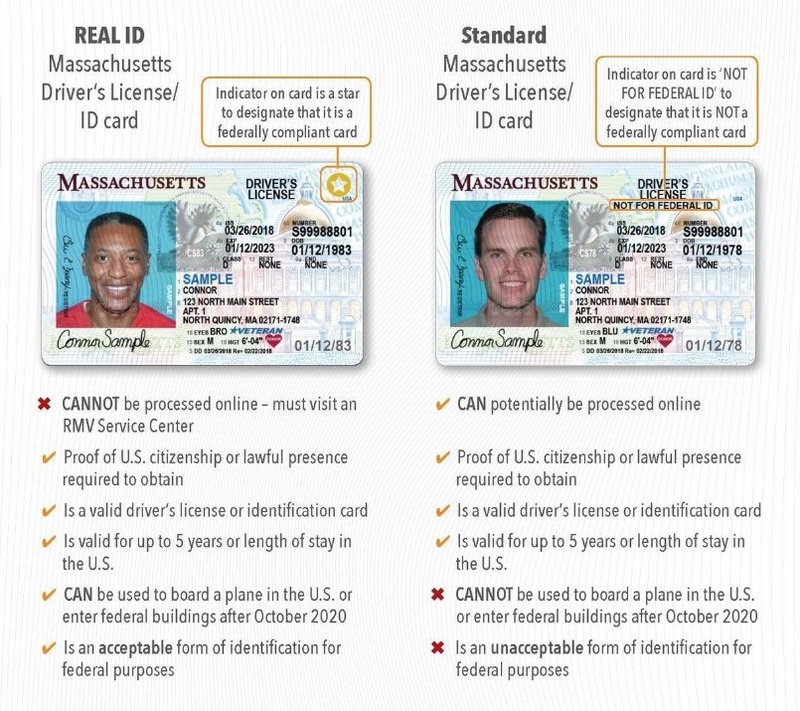 A REAL ID license/ID costs the same as a standard license/ID. If your license is up for renewal between now and October 2020, we recommend that you apply for a REAL ID, which will make it easier for you to fly domestically and conduct business in certain federal buildings. If your license is valid through October 2020, you may want to consider applying for a REAL ID in advance of this deadline. Be sure to allow plenty of time to identify and collect the required original documents and begin the application process in advance online.